• For quantitative determination of phospholipid and evaluation of drug effects on its metabolism. • Phospholipids are a class of lipids which constitute a major component of cell membranes and play important roles in signal transduction. Most phospholipids contain one diglyceride, a phosphate group, and one choline. BioAssay Systems method provides a simple, direct and high-throughput assay for measuring choline-containing phospholipids in biological samples. In this assay, phospholipids (such as lecithin, lysolecithin and sphingomyelin) are enzymatically hydrolyzed to choline which is determined using choline oxidase and a H2O2 specific dye. The optical density of the pink colored product at 570nm or fluorescence intensity (530/585 nm) is directly proportional to the phospholipid concentration in the sample. 1. I am looking for assay to measure phospholipids in cell culture media. I think the concentration in media maybe much lower than the serum. I am not sure whether if this kit is suitable for me. BioAssay Systems’ phospholipid assay kit has a linear detection range from 3 - 200 μM (colorimetric assay), and 0.6 - 20 μM (fluorimetric assay). We have not tested cell culture media, but believe it should work in most cases. 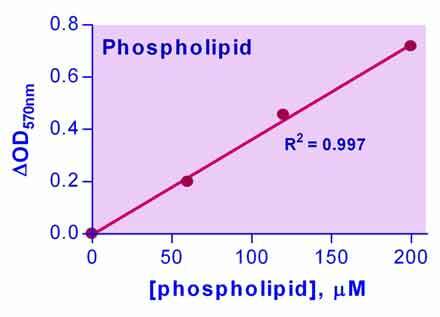 Common media formulations will contain about 5-10% FCS and the phospholipid content therein should be in the linear detection range of the assay. Other media formulations may have much lower serum concentrations or are serum-free. In those cases you should contact the manufacturer to get an estimate of how much phospholipid is in your medium.